New Sales Release at Renaissance at Roubion in San Ramon. We sold 5 homes during our grand opening, and we are releasing 3 more homes today. Stop by our Sales Center and tour our 2 beautiful models. Renaissance at Roubion is in an exclusive gated community nestled in the western hills of San Ramon offering some of the best views of the San Ramon Valley and Mount Diablo in the East Bay. 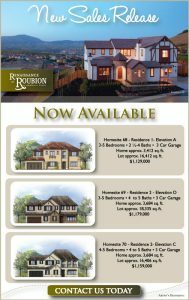 Renaissance at Roubion will offer 41 new single family homes with 4 different two-story floor plans ranging in size from approximately 3,400 to 4,300 square feet with 3 to 5 bedrooms. Renaissance at Roubion homes will be situated on large lots featuring charming courtyards where future residents will have wonderful spaces to enjoy the natural splendor of their beautiful community. While offering a serene community lifestyle that seems distant from the hustle and bustle of other nearby neighborhoods, Renaissance at Roubion is minutes away from its top-ranked schools, regional hiking and biking trails, along with great dining, shopping and entertainment. Renaissance at Roubion homes will all be solar-powered, with standard features that are designed to be Green Point rated, including tankless hot water systems, low VOC paints and materials, and Energy Star Appliances. Best of all, with a multitude of personalization options for room configurations and finishing touches, it’s never been easier to buy a home designed just for you.